Use this handy web based formatter to turn shameful code into neat DAX! I was watching Guy in a Cube (my favourite BI youtuber) with Patrick and in this particular episode they had a guest: Marco Russo. Marco told Patrick off for his messy "code" and said it was not DAX. If he thought Patrick's code was bad, what would he say about mine? 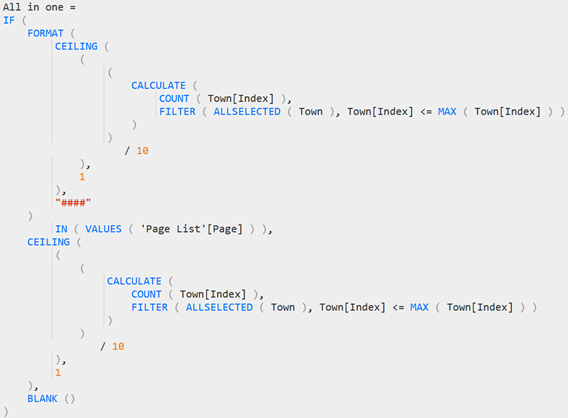 This is DAX code from my blog on paginating tables. With my SQL code I always pass it through a formatter such as PoorSQL but I never thought/knew that there was a DAX equivalent. You can find the website Marco showed Patrick here - it's called Dax Formatter.